It is an accepted fact in Washington that the Obama administration and the press corps that covers it—once considered essentially two units of the same team—are now bitter enemies. After four years of smoldering disenchantment, reporters have seized on the government’s rapacious subpoenas of media records and L’Affaire Snowden as the excuse they needed to break into open rebellion. A primary arena for the skirmishing is the daily White House press briefing, where the ritual evasions by the administration’s mouthpiece, long a staple of the undertaking, are now received by his questioners with a contempt rivaling that of the Bush years. National Journal’s Ron Fournier, a D.C. eminence and former Associated Press (AP) chief White House correspondent, recently proposed a kind of retaliatory collective action: “If WH journos boycotted briefings for week,” he tweeted, “would 1) readers / viewers miss news? 2) the WH get the message?” As someone who spent two years in the White House press office helping the press secretary prepare for these exercises in silliness, I humbly submit that a boycott would fall short of what’s needed. The daily briefing has become a worthless chore for reporters, an embarrassing nuisance to administration staff, and a source of added friction between the two camps. It’s time to do the humane, obvious thing and get rid of it altogether. I can say from experience that it doesn’t feel like the best use of time on the other side, either. During the first two years of the Obama administration, I was in charge of marshaling one-pagers of talking points for the binder that then–Press Secretary Robert Gibbs would carry to the podium. Most mornings, I would sit in his office as other aides paraded through to offer their “guidance” on whatever was in the news, which usually meant how to skate away without giving up much information. After finishing our lunches and untucking our ties from our shirts, we’d trundle down the hallway and through the sliding door into the Briefing Room, where I’d watch the exchanges play out from the fold-down staff seats along the southern wall. Gibbs and current Press Secretary Jay Carney differ in style—Gibbs often made me cringe by ignoring the talking points; Carney makes me cringe by using them—but the effect is the same, which is to say, ridiculous. A case in point: the briefing from Monday, July 8, the first since the ouster of Egyptian President Mohamed Morsi over the Fourth of July break and therefore theoretically a big news day. Carney—for whom I worked briefly and whom I like and respect—arrives at the podium 30 minutes after the 1 p.m. call time. “It is, as always, an honor and a privilege to be before you today,” he says. (He’s kidding.) “For that reason, I had a little catching up to do, and I apologize for being tardy.” As will soon become clear, the extra cramming has served no clear purpose, since he parries every query with a noncommittal reply. By tradition, the AP gets the first question. Its correspondent, Nedra Pickler, starts in with the day’s hot topic—whether the administration is prepared to deem the overthrow a coup, which would trigger a cut-off of all aid to Egypt. After reciting some filler from the pages in his binder and twice claiming that he will “be blunt,” Carney arrives at the following: “I would say that we are going to take the time necessary to review what has taken place and to monitor efforts by Egyptian authorities to forge an inclusive and democratic way forward.” Steve Holland of Reuters, displaying an actual bluntness that draws titters from the room, tries to pin Carney down: “Are you trying to find a way not to cut off aid?” Carney’s reply: “I think I would say on the question of aid, the relationship between the United States and Egypt goes beyond a provision of assistance, and it is based on decades of partnership and our commitment, this country’s commitment, to the Egyptian people.” It was for such pro-level dodges that Carney was honored in a minor masterpiece, “The Top 9,486 Ways Jay Carney Won’t Answer Your Questions,” put together by Yahoo! News. At the same time, it’s worth asking what the press hopes to accomplish here. 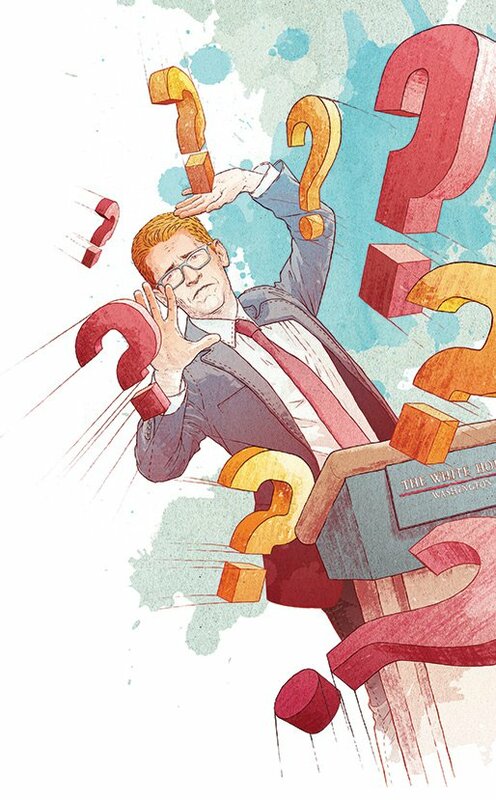 Carney’s refusal to give straight answers tends to obscure the fact that the questions are pretty pointless, too. A big decision such as whether to stop aid to a major partner in the Middle East will be made slowly and iteratively. Any shift in policy would begin as an official recommendation from the gorgon-headed collective of national security chieftains known as “the Interagency,” which would then need to be approved by something called “the Principals Committee,” and finally by the president himself. It is not going to be hashed out during a televised exchange between the press secretary and a reporter from Reuters. The reporter from Reuters knows this, of course, but he has to ask about the day’s big story anyway. As does the colleague next to him, and the colleague next to her, each getting in a swing. Meanwhile, even as the briefing dawdles on to less weighty matters (“About the congressional picnic that has been postponed, what was behind that?”), the press secretary remains duty-bound not to say anything specific or interesting. If there were a Hippocratic Oath for the position, it might begin: “First, make no news.” The goal is to make it through without inciting an international crisis or stepping on the president’s cheery message of the day, and then to return to the office and get down to actual business, including figuring out which of the administration’s three favored outlets—The New York Times, AP, and Mike Allen’s “Playbook”—will get advance word of the Egypt decision when it finally gets made. Generally, this is a better way to do things: The article that results tends to be more thorough and nuanced, which is good for both the White House and the writer. And while it annoys less fortunate outlets, eventually everyone does get a turn. Once upon a time, the daily briefing was just the press secretary walking out into what was then called the Press Lobby—it had beige leather sofas and coffee tables and a card table with wooden captain’s chairs—making a few announcements about what the president was up to and taking a handful of questions. The idea, veterans say, was to provide a regular forum for the White House and the press to talk to each other, not to provide actual news content. During the early 1980s, President Reagan’s press shop installed the theater seating and the more formal vibe. Then Clinton spokesman Mike McCurry let the whole thing be on-camera; he’d worked in the State Department, where briefings were already televised, and (he told me sheepishly) didn’t see the harm. “It was just a complete zoo in there,” he said of the ensuing Lewinsky-era brawls, and it has been ever since. Many of the reporters I spoke with expressed an affinity for the “gaggle” format, wherein journalists gather in the press secretary’s office for a more informal, untelevised exchange. Restoring something like the old Press Lobby setup would effectively establish the gaggle as the new norm and cut down on the circus tricks; it would also leave the network people with less b-roll for their segments, but they’d live. Some White House journalists also suggest a second fix, at once simple and highly improbable: having the president himself spar directly with the press more frequently. Adviser-types get squeamish about it, but presidents really do tend to be their own best spokesmen, as President Obama showed at a late-June press conference in Senegal. Asked about America’s pursuit of Edward Snowden, the commander-in-chief responded with the kind of color, brevity, and authority almost never matched during a daily briefing: “I’m not going to be scrambling jets to get a twenty-nine-year-old hacker,” he said. Question answered.